What Day Of The Week Is August 6? 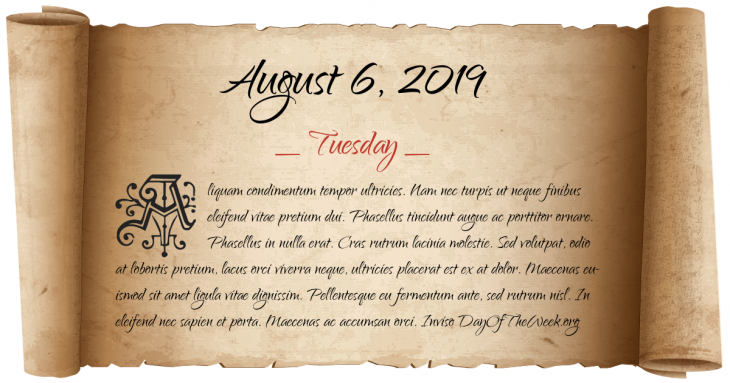 August 6, 2019 is the 218th day of the year 2019 in the Gregorian calendar. There are 147 days remaining until the end of the year. The day of the week is Tuesday. If you are trying to learn French then this day of the week in French is mardi. Here’s the August calendar. You can also browse the full year monthly calendar. Leo is the zodiac sign of a person born on this day. Peridot is the modern birthstone for this month. Diamond is the mystical birthstone from Tibetan origin that dates back over a thousand years. The United Kingdom annexes Lagos, Nigeria. Kiowa land in Oklahoma is opened for white settlement, effectively dissolving the contiguous reservation. Harry Houdini performs his greatest feat, spending 91 minutes underwater in a sealed tank before escaping. Queen Wilhelmina of the Netherlands becomes the first reigning queen to address a joint session of the United States Congress. Cuban Revolution: Cuba nationalizes American and foreign-owned property in the nation. The largest swimming pool in Europe was opened in Fürstenfeld, Austria. Braniff Airlines Flight 250 crashes in Falls City, NE killing all 42 on board. Zulfikar Ali Bhutto lays the foundation stone of Port Qasim, Karachi. A low-pressure system that redeveloped off the New South Wales coast dumps a record 328 millimeters (13 inches) of rain in a day on Sydney. Heavy rains and debris kill 72 in the Kagoshima and Aira areas of Kyūshū, Japan. Who were born on August 6?